For Cass, the life of a 'scav' is all she’s ever known – scavenging what’s left of London in search of a precious relic no-one, not even her new Russian masters, has ever seen. But when two survivors from another time show up, claiming they hold the key to the whereabouts of the missing ‘artefact’, scavving will never be the same again. They have six days to find it before their world will come to an end. 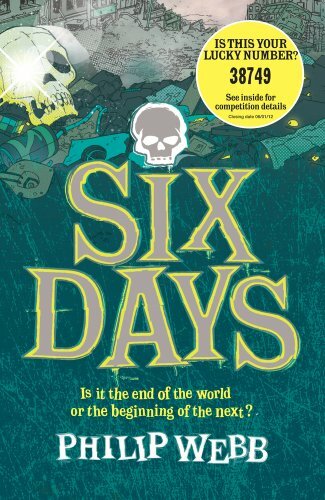 A gripping post-apocalyptical adventure set in the ruins of London about a desperate race to find a relic of extraordinary power. Spectacular science-fiction debut from Philip Webb. 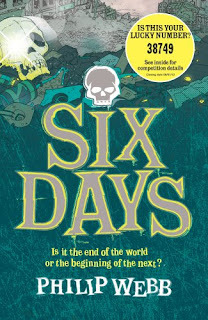 Six days is a dystopian sci fi adventure which is aimed at a younger YA audience. If you enjoyed Beth Revis's Across the Universe you will definitely enjoy this one too. I must admit the start of this book left me a little confused. You are thrown in at the deep end in a world which is different from our own. The London you are in has been totally annihilated by some kind of biological weapon and then by scavs tearing the place apart searching for an "artifact". The people are living are tough lives ruled by a upper class who treat them like slaves. The language used in the story by the main characters very much reflects their social position within this world and takes some getting used to but by the end becomes part of its charm as well. The main characters in this book are a sister and brother called Cass and Wilbur and you follow the story through Cass's eyes. They come from a scav family and have spend much of their lives searching for the artifact. Whilst Cass is a realist who gets on with it, Wilbur is much more of a dreamer and has ideas about using his comic books as clues to help him find the artifact. When you first meet them this is in fact what he is doing despite being told not to wander off. Whilst off hunting he has an accident and is saved by his sister and a mysterious stranger who is more than meets the eye and from then on the adventure really kicks off. What I liked about this book is that it was both dystopian and sci fi and as I said it did remind me in many ways of Across the Universe with the sci fi elements. I'm not going to tell you anything specific about the storyline itself but I will say that once the action and adventure kicks off it keeps you engaged throughout and wanting to read page after page to find out what happens next. I loved following the main characters in their hunt for the artifact and loved seeing what the author did with the plot as I was surprised throughout in the way in which it turned out. All in all a really enjoyable book which is exciting throughout and would appeal to both dystopian and sci fans. I just posted my review today! :) I agreed with basically everything you said though, especially about Across the Universe reminders, I got Inside Out by maria Snyder! I loved across The Universe so I'll be taking a look at this one. I never did get Across The Universe from the publisher. Never mind, I have this one and I look forward to reading it. This one sounds quite interesting! Will look out for it.